I am not the guy who tried to pass off the hoax that he punched out Jesse Ventura a few months ago. That guy was obviously a faker trying to get in on the latest fad of punching out Jesse Ventura. But if you’re one of the hundreds of people who actually have punched out Jesse Ventura, tell us your story! It doesn’t matter how absurd it sounds: I will still publish it for the world to see! If anyone needs a punch-out story in the future for political purposes, they will have their choice of dozens of real stories instead of one phony story. I punched Jesse Ventura in the face and knocked him out cold. It was at a book signing for his book I Ain’t Got Time to Bleed. I remember it well cause it was just one month and 4 days after my 23rd birthday. The smell of springtime still lingered in the air. I said yes, though others have commented that it was also a good Irish name. He then cocked his head (or re-cocked it; it had already been cocked a bit at the start) and told me, blatantly, fervently, and apparently with some thought, that although he himself, Jesse Ventura, had served under the Lithuanian Grand Duke Jogaila (Władysław II Jagiełło), during the Jagiellon dynasty (1386–1572, he now felt that the soldiers he served with, though dead for over 600 years, deserved yet to die, those who were still alive! I shuddered. Then I swung. I hit the old man (this being 2000 he was only 740 some years of age though considered aged by some) clean in the face, breaking both his nose and my hand in the process. Realizing instantly that I had just committed a felony, I scurried, scampered and skipped out the door and into the street, then on to places untold. I was fortunate that nobody else in the book store saw what had happened because they were all drunk. 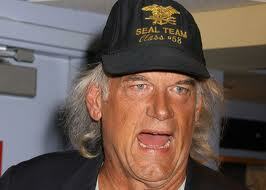 I was also surprised that Jesse Ventura never pressed charges for assault against me. Although he had just written my name in a copy of his book that I had left behind in the confusion, and my face was well known in the community for my involvement in the ‘End Meaningless Protests Now’ movement (the father of the Occupy Wall Street I have been called), I was lucky enough to escape the law for all this time. So is the statute of limitations. Jesse Ventura, it was I, Chris Cudnoski, who punched you out in front of hundreds of witnesses and got away scot free, having heard nothing about the event though I have scoured every tabloid and searched every google engine for either my name, my face, or your face and my fist. I am the one who should be famous right now, not you. I demand to be famous! 1. Make sure there are at least 70-100 other people around when you do your punch. Mr. Ventura is a celebrity, which means that he is surrounded by a natural aura of ‘unrealness’. Time slows down in his presence, jokes seem funnier, and random acts of insanity or violence seem to be anticipated and expected by those in his presence. It will take witnesses at least a day or two to come down from the high that celebrities generate which will give you plenty of time to escape. And that’s assuming they even see it happen. Most people spend about 1/5th of their time in the presence of famous people actually looking at them, and the other 4/5ths looking around at all the other regular people giving wide-eyed looks of disbelief and disconnect, trying to point subtly in the direction of the celebrity while mouthing ‘look, it’s that one guy, Hulk something, or rummaging around in their purse or wallet for something suitable to coax the celeb into signing. Those few who actually do see it happen will immediately, via their innate herd-mentality, look to others for clues and signals of how they should react. This will lead them to pull out their wallets and search for their old military I.D. while pointing subtly, giving wide-eyed looks, and mouthing ‘hey, look’, which will allow you plenty of time to get away. 2. Keep your thumb on the outside of the fingers so you don’t break it. 3. If you’re an autograph hound, get it before the punch, not after. If he’s not unconscious he will be a bit woozy and the autograph will look like you faked it anyway, plus he might call the police. Also your old I.D. has your name on it which you don’t want him to know. 4. Plan ahead. Wear loose-fitting clothing so your swing won’t be restricted, and shoes with good ankle support. Also, red or black shirts will obscure any blood splatters. 5. Don’t be drunk or high as you may miss his face and end up putting your arm around his shoulder which may be interpreted as an invitation to dance. If he does start dancing with you, avoid having him step on your feet (steel-toes may be a good idea) and try to disengage before he either body-slams you or puts you in a sleeper hold. 6. If you’re going to have a friend film the punch for later sale to a tabloid, arrive early and get your lighting and sound set up right as this increases the resale value of the footage. 7. Don’t be a celebrity yourself as Jesse may recognize you. 8. Lastly, relax and remember to have fun! Have you ever been punched out by a politician, a wrestler, or both? I punched out Bill O’Reilly – World Exclusive – Would have mentioned it earlier honestly but I totally forgot about it until just now for real. I’d start a separate blog on this topic but I don’t think there are that many other people who have leveled ol’ Riley due to the myth that he is tall. He is not tall. The guy is a shrimp. I watch him all the time and I’ve heard celebrities talk about him and say things about how tall he is. You are all liars and sellouts. What is he paying you to reconfirm this myth? I bet it isn’t even very much. OK, to the story. I was in Chicago on the way back from the Six Flags down there and wanted to go one one last thrill ride, so I went to the top of the Sears Tower. Getting off the elevator my eyes were drawn up and out to the skyline, and I walk right into this guy what his head don’t come up but to my sternum. On account of the ‘Chi-Guy’ hat I had just purchased he must of took me for a native. He starts saying how all Chicago-anians are the same, all communists and leftists supporting al-qeada and the Khmer Rouge, and how he hoped the Bears crashed their team airplane into the oldest part of Lambeau Field. I punched the little guy out at this point, partly because I’m a Wisconsin-etian, and also of course to protect him fr om himself and others lest he say something outlandish or offensive and make somebody mad. Right in the middle of his big square forehead. I took in the view for a minute or so but it was kind of hazy, and that makes the vertigo worse somehow, and I had just punched out a major television personality in front of dozens of people, so I thought I’d split. I rappelled down the stairs and was gone.